Like Batman spotting the bat-signal in the starry night sky or Spiderman sensing the tingle of his spidey-sense, I’ve been beckoned to help a family being torn apart by a culinary crisis. 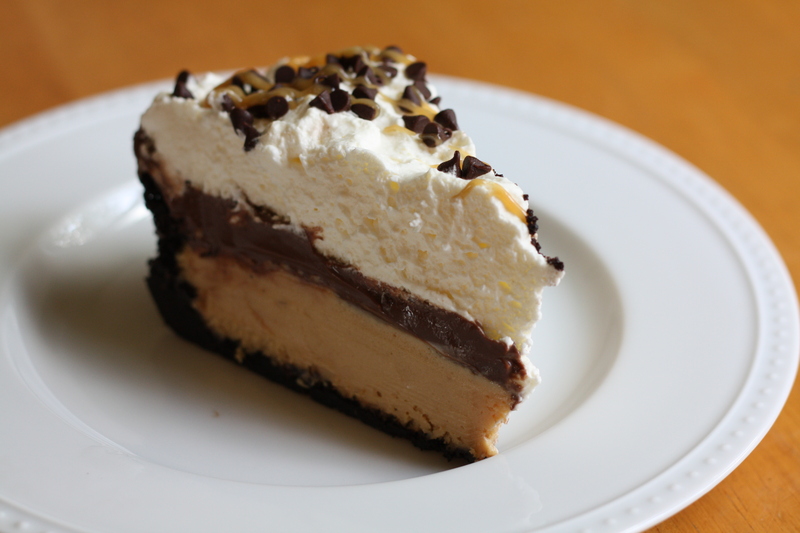 The trouble centers around a Chocolate Peanut Butter Cream Pie, a current featured dessert from our local grocery store, Wegmans. 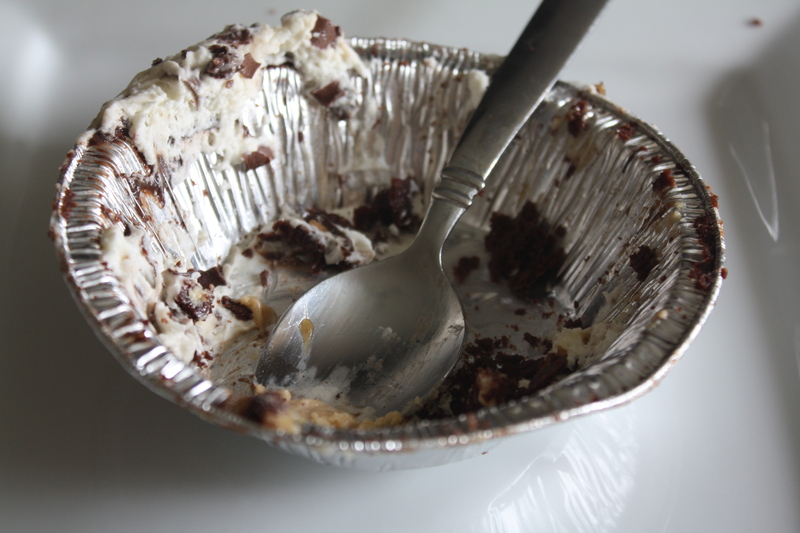 According to my sister-in-law, several battles have already ensued over the last piece of this dreamy, creamy pie. Even worse, there will come the day when Wegmans switches over to its seasonal pumpkin pie, leaving this poor family sorrowfully crying over the supermarket dessert case. No, no. This will not do. I must devise a suitable recipe to replicate this family’s beloved treat. First, I need to know what we’re going after. So, I went down to the grocery store to purchase one of these battle-worthy pies. According to my son, who is a master of imagination, the grocery store is ridden with wolves. Luckily his younger brother was around to save his day and we left unharmed with the pie in hand. Better taste it again, to make sure I’m not missing some important detail. Alright, I think I’ve got it. Seriously, I deserve some sort of hazard pay for this stuff. *The easiest way to crush the cookies is to place them in a ziploc bag and roll a rolling pin over them until they are completely crushed. Preheat oven to 350 degrees. Combine the cookie crumbs with the melted butter. Press the mixture onto the sides and bottom of a deep pie shell. Bake for 8 minutes. Remove from the oven and cool completely. In a saucepan, mix together sugar, cornstarch, cocoa, and salt. Whisk in 1 cup of milk, stirring until combined. Whisk in the remaining 1/2 cup of milk and 1/2 cup of cream. Continue whisking over medium heat until the mixture begins to bubble and thicken, about 5 minutes. Whisking constantly, continue cooking for another minute or two. Be careful to whisk into the corners and along the sides of the pan. Remove from heat. Whisk in the chopped chocolate and vanilla, stirring until fully melted. Allow the pudding to cool at room temperature, stirring frequently to prevent a skin from forming. Meanwhile, prepare the peanut butter filling. In a large bowl over an ice bath, beat 2 1/2 cups of heavy cream with 1/3 cup confectioner’s sugar until stiff peaks form. Keep the mixture cool over the ice bath. In a separate bowl, beat together peanut butter, cream cheese, and 2/3 cup confectioner’s sugar until evenly combined. Fold in 1/2 cup of the whipped cream to lighten the mixture. Then, gently fold in another 1/2 cup whipped cream, just until combined. The mixture should be light and fluffy. Keep the remaining whipped cream cool over the ice bath or in the fridge. Combine peanut butter and corn syrup. Mix to combine. Spoon the peanut butter filling into the cooled pie crust. Refrigerate for about 15 minutes to set the mixture. Pour the cooled pudding over the peanut butter filling. Refrigerate for about 15 minutes to set the pudding. Spread the remaining whipped cream over the top of the pudding. Sprinkle with mini chocolate chips. Drizzle with the peanut butter mixture. Garnish with a mini peanut butter cup. Refrigerate for at least an hour to allow the pie to cool completely. Now, I have to be honest with you. 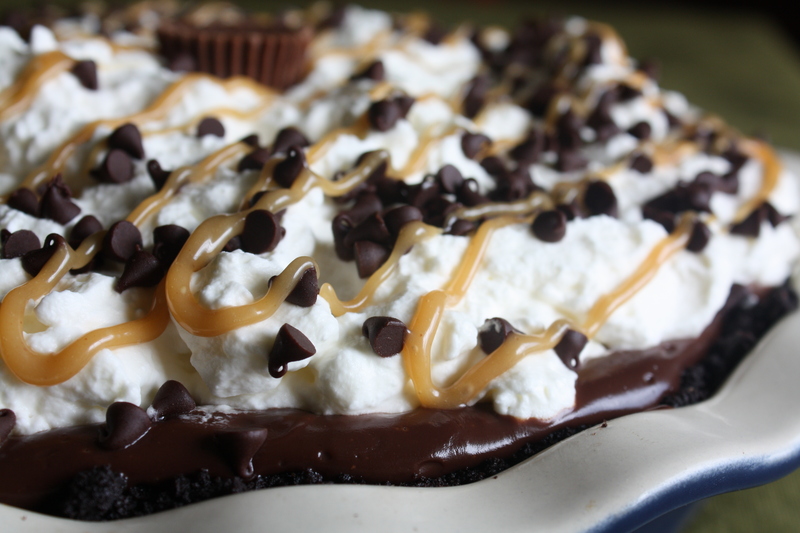 There’s a reason why there’s not a lovely picture of a perfect slice of peanut butter heaven. 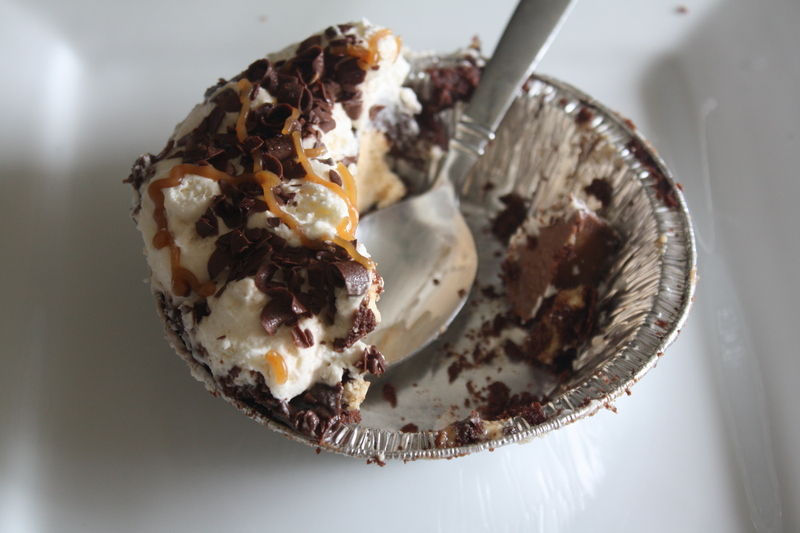 When I cut the pie and tried to plate a pretty slice, it became a peanut butter, pudding, and cream mess. The pudding was the real issue. I substituted 2% milk instead of whole and as a result of a minor toddler crisis, I didn’t cook it as long as it should have cooked to properly thicken. If you follow the recipe as written, you shouldn’t have this problem. This is the same pudding recipe I wrote for the Chocolate-Covered Pretzel Squares a month or so ago. Cooked as written, it’s a thick, dark chocolate pudding, firm enough to stand up to slicing. So, do I as say, not as I did, and you should be golden. 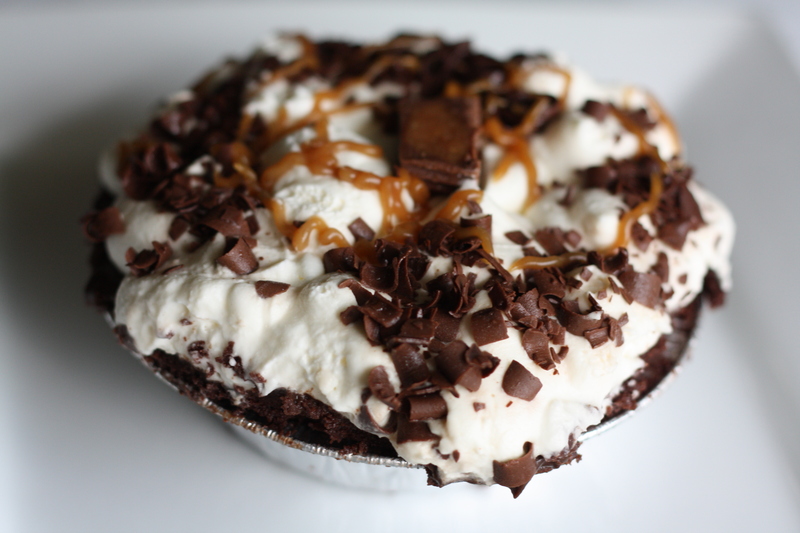 Hey sis… You know where to find your pie! Better hurry! Posted in Baking, Chocolate, Desserts, Food, Recipes and tagged baking, chocolate, Cooking, Eating, Food, food photography, peanut butter, pie, Recipes. Bookmark the permalink. perfect timing! My husband’s favorite dessert is pb & choc and his b-day is coming up on Tues.
I’ll be making this… or, do you take orders??!!!!!! 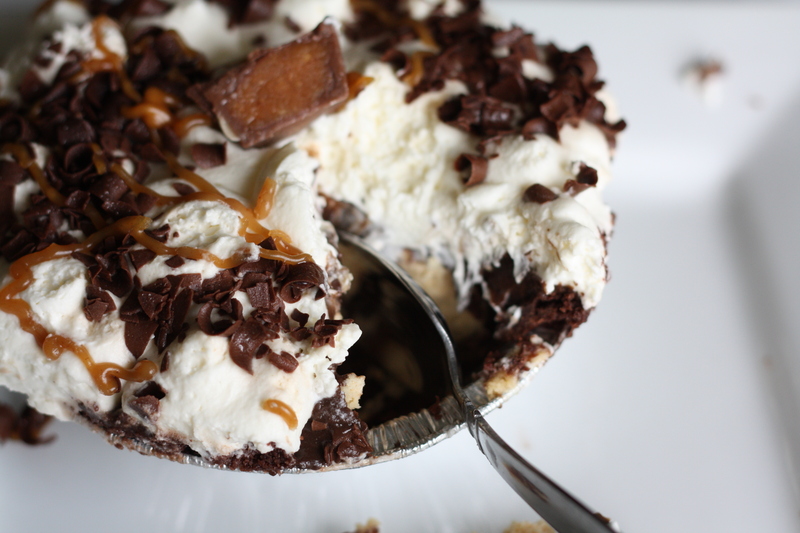 you gotta love Wegman’s, I have to admit I have not seen this pie at my store…..Your version certainly looks every bit as good, I am bookmarking this recipe, it sounds like a winner for sure! I DO love Wegmans! Best supermarket I’ve ever been to! Huge selection. Excellent quality. And they really make an effort to use local produce. I appreciate that! Wow! 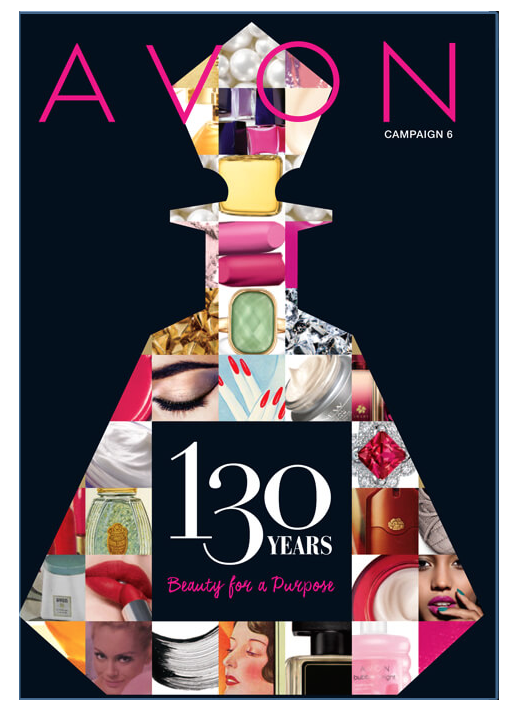 This looks so decadent…is it legal? Gotta try this love PB and Choc! 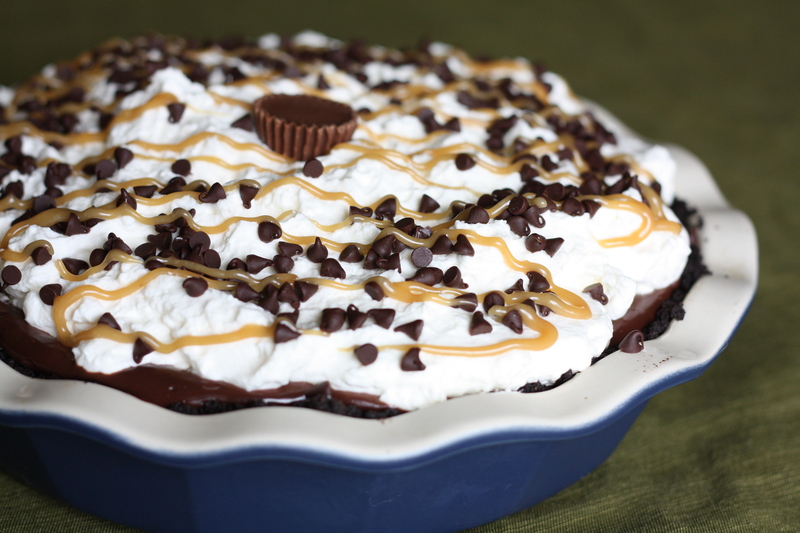 With my chocolate/ peanut butter addiction, this pie is a MUST try!! This looks absolutely yummylicious! Can I have a bite? Holy shmokes this looks great! this was DELICIOUS and tasted exactly like wegman’s pie!!! you are amazing…thank you so much for posting this! my husband has been craving this since we went back east to visit family at x-mas. we are the unfortunate souls who do not have a wegmans here in LA. many thanks!! Making this third time. It is AMAZING!